It would have been a quick recipe had I not been distracted by taking pretty pictures of my muffins in various stages. ***Sigh***. I need to take a photography class so I can get these pictures quicker and I don’t have to waste time fooling around with the camera. Also, I’m a huge slob and I make a ginormous mess while baking or cooking. Case in point: Anyway, you should be able to whip up these muffins in well under an hour if you don’t stop to take pictures. Although, I won’t blame you if you do. 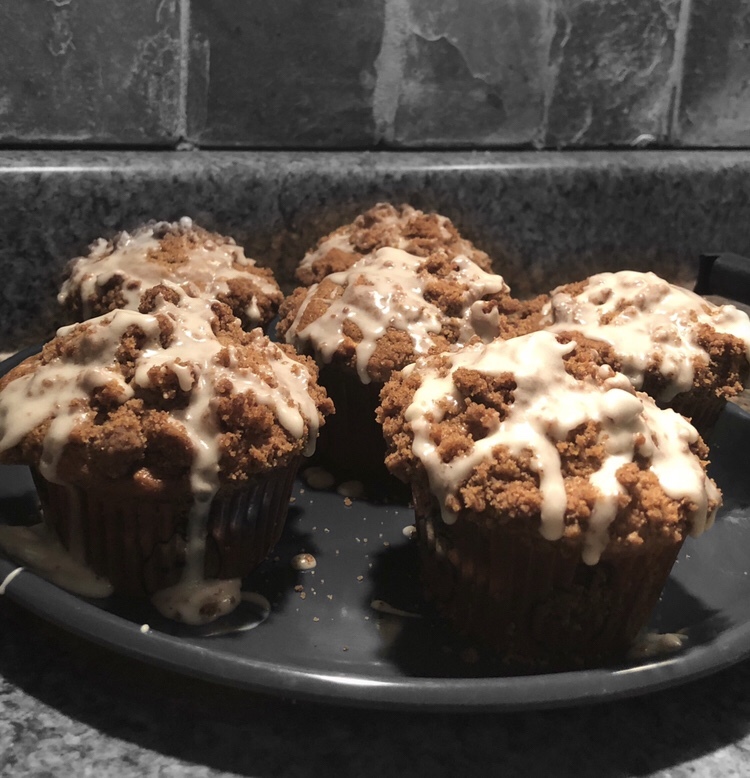 These apple streusel muffins are really photogenic. These muffins consist of three parts—the muffin itself, the crumb top, and the glaze. I made the muffin mix first. 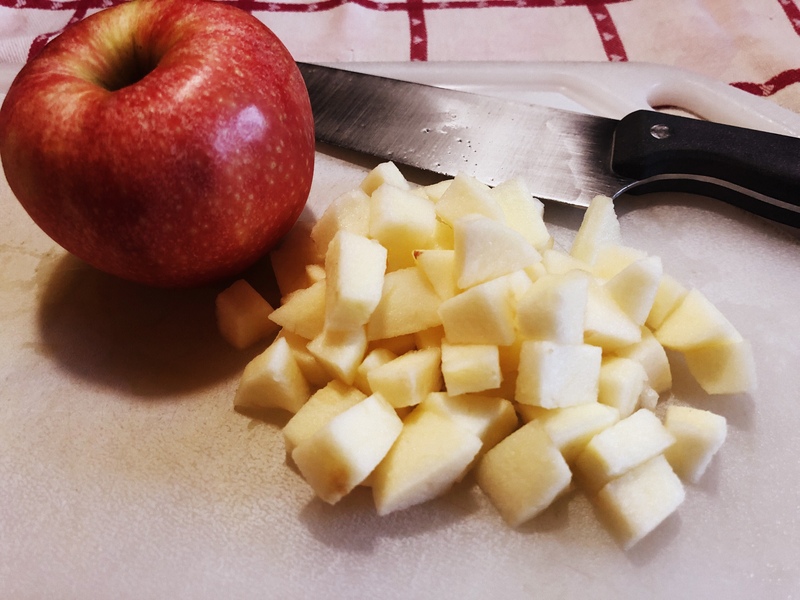 The most difficult part of this is peeling and chopping the apples. I used gala apples in my muffins, but you could use any type of apple you prefer. The apple flavor isn’t overwhelming, but the occasional bite sizes pieces of tender apple are delightful. Cream softened butter, brown sugar, and granulated sugar together. I used my Kitchen Aid mixer for this step…have I mentioned how much I LOVE my Kitchen Aid mixer? 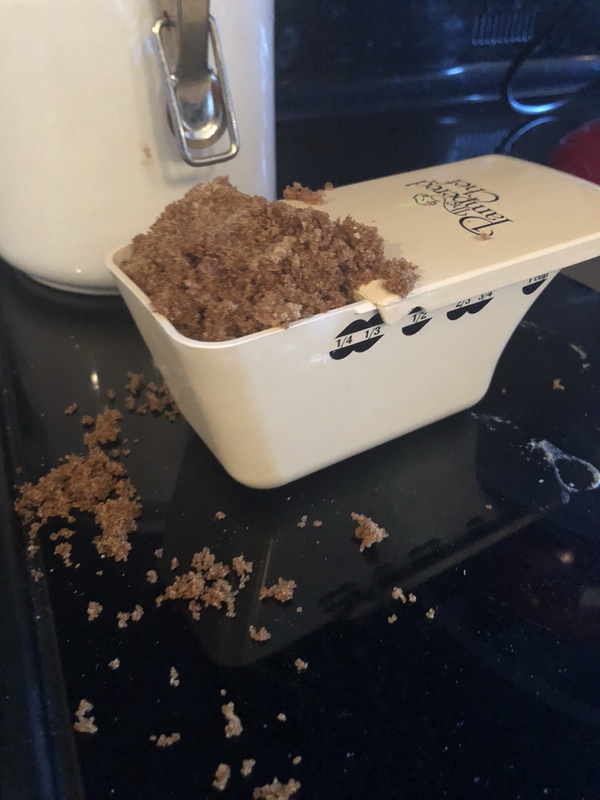 It made it so easy for me to mix the butter and sugars while prepping the crumb topping at the same time…multitasking! Then I added the eggs, sour cream, and vanilla extract to the mixture. 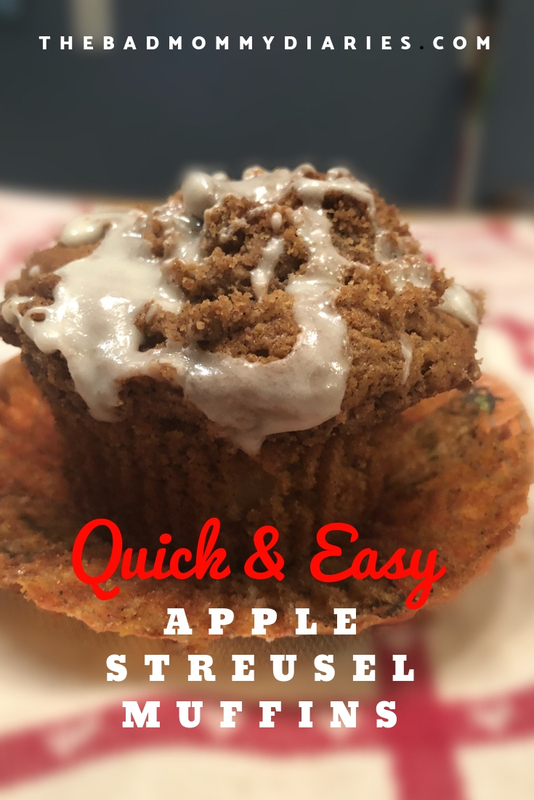 I think the sour cream is really the key to creating these moist apple streusel muffins. In a separate bowl, I whisked the flour, baking soda, baking powder, cinnamon and salt together. 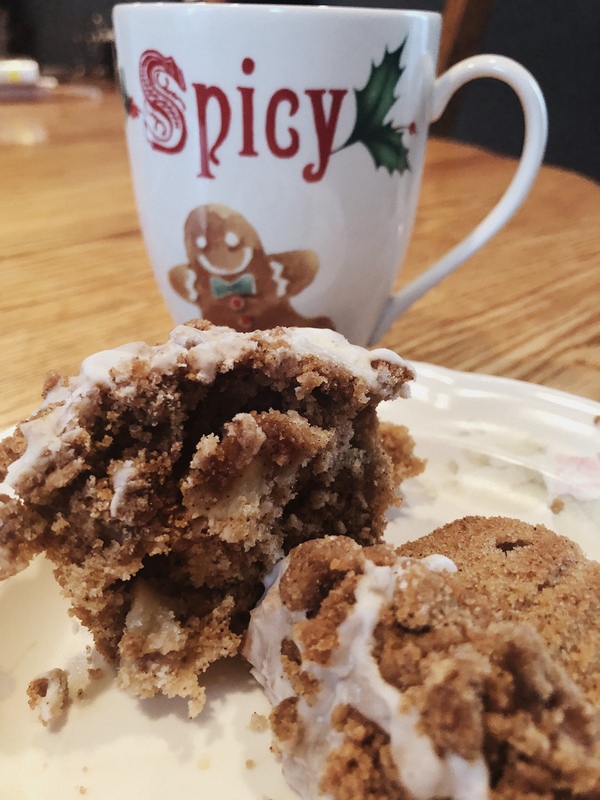 Now, I adapted this recipe from a few different recipes I found on Pinterest, and none of them had enough cinnamon to my liking. 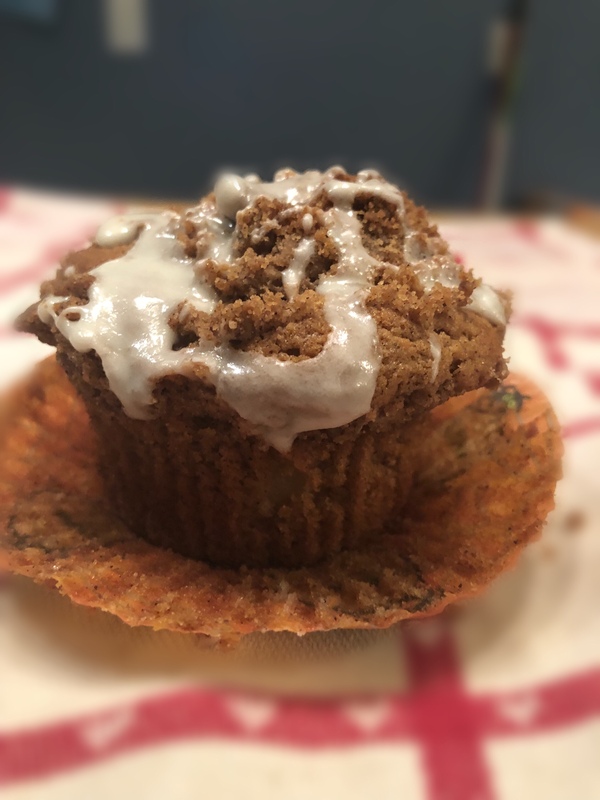 I think the most import component to a delicious apple streusel muffin (besides the streusel part, that is), is the cinnamon. You need A LOT of cinnamon. So my recipe has 2 tsp of cinnamon and the others have less. If you don’t like a lot of cinnamon, feel free to reduce it…I’m thinking you want the most flavor for your muffins, though. Add the flour mixture to the stand mixer bowl and mix until combined. Then add 1/4 c. heavy cream and the chopped apples. So simple. Melted butter, granulated sugar, brown sugar, and cinnamon. Mix these ingredients and then add the flour until you’ve made a crumbly topping. Bam! Pour the muffin batter into a muffin pan lined with muffin cups. Fill the cups to the top (we’re making some pretty big muffins here). Then top with the crumbs—make sure they are sticking to the top of the batter otherwise they’re going to fall off. Stick in the oven for 5 minutes on 425 and then reduce to 350 for the remaining 18-20 minutes. 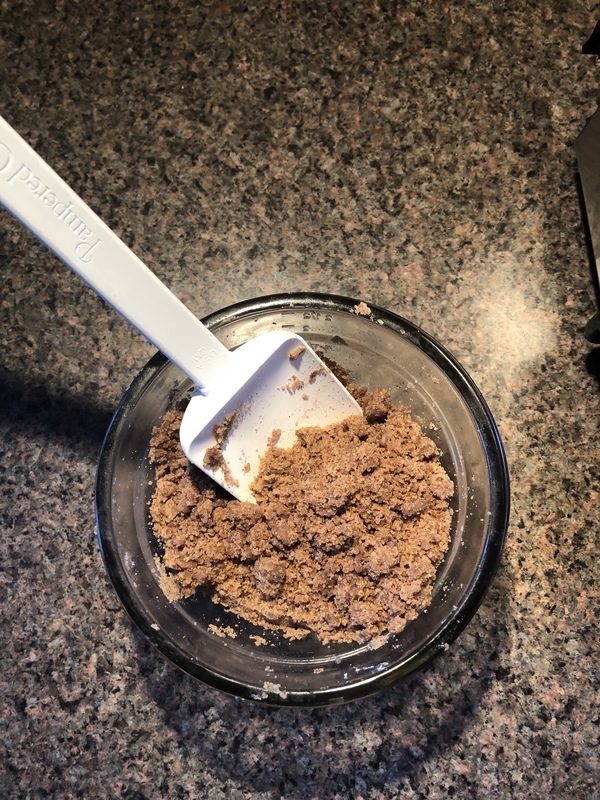 This was a tip I saw in another muffin recipe. Allegedly, this causes the muffins to rise quickly and it creates that high top you see in bakery muffins. I’m not sure how well it worked in my craptastic Oven, though. So while the muffins were baking, I made the glaze topping. I used confectioner’s sugar and heavy cream. Confectioner’s sugar is great to have around if you’re baking because you can whip up icing and glazes so easily. It’s cheaper and quicker than going to the store. As the apple streusel muffins came out of the oven, I was overpowered by the incredible scent of apple and cinnamon. I could barely wait to taste one. I did have to wait a few minutes for the muffins to cool enough to glaze them, though. But after that…I dug in. With a cup of cinnamon apple tea. It was the perfect compliment to a warm treat on a chilly autumn night. Are You Team Apple or Pumpkin?